Is That Falafel In Your Pocket, or Are You Just Hungry? Disclaimer: Watch out how you pay here. They stole my credit card number, so caveat emptor! Hello to everyone out there in the blogosphere! Welcome to another entry to Mastication Monologues. A bit of time has passed since my last post, but I guess that’s what happens when grad school rears its ugly head. Anyway, today I’m going to be reviewing a new place that I have never been to before, but I was very happy after eating there. 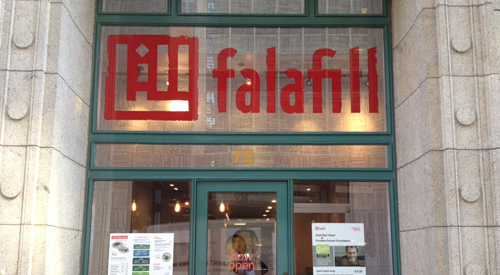 It is called Falafill and is located at 72 E Adams St Chicago, IL 60604. It would make a great pit stop before or after visiting the world-famous Art Institute which is less than five minutes away. Now, I’ve had my fair share of Middle Eastern/Mediterranean food with gyros, baklava, doner kebab, and dolma etc. 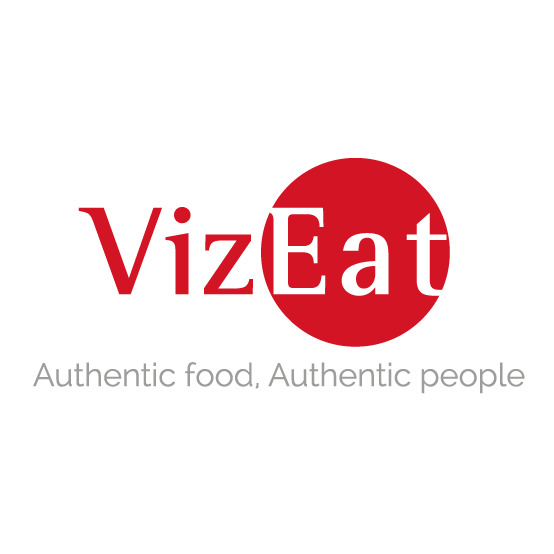 all over the US/Europe, so I was wondering how good this place could be when my friend described it as a place where you create and garnish your own falafel. All I kept on thinking of was some sort of Middle Eastern Fuddruckers, but I highly doubted they would have one pound falafels for me to tackle in a demonstration of my gastronomic might. So I decided to visit to see what all of the hubbub was, and I was immediately greeted with free samples outside of the door. I took the traditional falafel sample which was coated in a typical yogurt based cucumber sauce. The falafel itself was quite crisp and flavorful with a crumbly, chickpea-based interior that was packed with spice and herbs. However, I ended up getting the curry falafel which was made of lentils instead of the traditional chickpea falafel I sampled at the door. When they brought it out to me at the same counter I ordered it at, I was surprised at how large they were as they lay there in the gaping maw of the pita bread that looked more substantial than a traditional unleavened pocket. With our falafel bread mini-baskets in hand, we got down to business at the “mezza bar” that contained literally a bevy of sauces (babaganouge, hummus, jalapeno and cilantro, harissa, tzatziki, garlic), tabbouleh, and plenty of pickled vegetables like beets and peppers among many other garnishes. I was like a kid in a candy store with all of these fresh and powerful flavors, but I festooned my falafel with a helping of babaganouge, hummus, tabbouleh, jalapeno and cilantro sauce, and harissa sauce. When picking a seat, I noticed something that I didn’t really care for: communal seating. At this location, they only had seats along the wall where you face a wall/window or one large table where you sit cheek to jowl with your fellow diners. I just didn’t like it since it seemed like an invasion of privacy sometimes with conversations, but I guess it wouldn’t matter if you were just there for a quick bite to eat. Anyway, back to the food. After semi-attempting to figure out how to lift the pita out of its box without having its contents cascade down the front of my shirt, I just gave up and used a fork. An example of their falafel with pickled beets, giardiniera, and tabbouleh. This kind of made me sad and wished that they embraced more of a gyro type of pita that provides more of a wrap/taco kind of sandwich instead of this Muppet-mouthed piece of pocket bread. Nevertheless, once I took a bite of what was lurking inside the bread, I was thoroughly satisfied. Below the perfectly fried crust, the curry falafels had the sultry taste of yellow curry. This boldness was mitigated by the cool hummus, babaganouge, and the freshly made tabbouleh. However, the harissa sauce and the jalapeno and cilantro managed to jazz up the falafels chilling at the bottom of the bread pocket with a lively and savory kick of spicy flavor. Plus, once I finished a couple of the top falafels, I was able to lift the bread and eat it like an actual sandwich. I do have to say that their artisanal baked bread was delicious, fresh, and did not buckle under the stress of the contents of the sandwich. So, perhaps next time I will order their bowl option to see if that works a bit better in terms of the logistics of eating it. 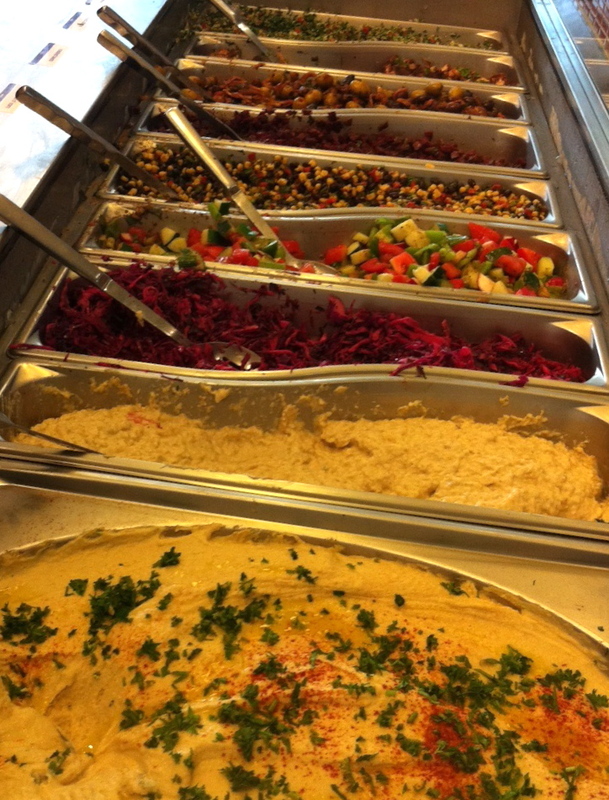 So if you’re tired of the hamburgers, hot dogs, Italian beefs, and Mexican dishes that are standard Chicago fare, try a new take on Mediterranean food by getting your fill of falafels at Falafill! Posted in Middle Eastern/Mediterranean Cuisine and tagged authentic, babaganouj, Chicago, chickpea, dining, falafel, Food, fried, hot sauce, hummus, Illinois, lentil, Mediterranean, Middle East, pita, restaurant, Reviews, Sandwich, sauce, taboulleh. Bookmark the permalink.